As we end 2004 and start 2005, it's heartening to see how quickly people in general and Americans in particular have responded to the disaster caused by the tsunami in India, Sri Lanka, and all around that region. According to the American Red Cross, by Wednesday it had received about $18 million in donations to its International Response Fund in the three days since the waves struck. From all I've read and seen, a lot more will be needed. The American Red Cross, with its links to local Red Cross and Red Crescent organizations in the affected countries, seems like one of the best ways Americans can get the right kind of aid to the people who need it. You can help by making a donation and selecting the International Response Fund. This link will take you to their donation page where you can use the online form or click on the "Donate by phone" or "Donate by mail" links for other methods. Let's send them a wave of relief! Last week's USA Weekend magazine ran an interview entitled Computer Counselor featuring Kelly Chessen. She's a psychologist now working as a "data crisis counselor" at DriveSavers in Novato, California. comforting poor souls whose computers have been melted in fires, dropped into rivers, run over by cars and in one case, shot. "Sometimes people will threaten to throw their computers out the window," says Kelly. "Hard drive failure happens every day, but it doesn't happen to everybody every day," she continues. While DriveSavers can do a lot with severely damaged drives (visit their Museum of Disk-asters) and Kelly exudes confidence that most such disasters can be fixed, she states the success rate as 90%. For the other 10%, the implied advice might be longer term counseling. Q: Where do you keep important data? A: My trusty yellow pad of paper. I hear horror stories all day. Do I want to lose all of my financial information? No! As I've urged in prior posts (here and there), if you're considering a move to a "paperless office" you first ought to read The Myth of the Paperless Office by Abigail Sellen and Richard Harper (MIT Press 2002). There you'll learn at least a half dozen reasons why yellow pads and other forms of paper outperform computers and other digital media for some information storage, retrieval, and manipulation tasks. The authors studied a diverse set of knowledge workers in a wide range of settings. One or more should trigger ideas helpful in your own situation. If you haven't read it, don't argue with me (or Kelly). Keep your yellow pads handy. And seek help from a qualified professional. Thanks to Joy London for including Knowledge Aforethought in her list of favorite U.S. "blawgs" (those are blogs written by, directed at, or somehow related to lawyers; I confess I'm one of them) in an article just posted in the December 2004 issue of Legal IT. Actually, she lists nine U.S.-based blawgers, but if you place her in Allen & Overy's NYC office and add her own blog, I've made a Top Ten list! (See how that lawyer training comes in handy, when you need to rationalize a result?) And what great company she's put me in, too! The article itself provides a very good summary of the evolution of both blogging and one of the very best blawgs online. Joy's excited utterances has been one of my favorites since I first heard of blogging (back in pre-historic 2003). For anyone concerned with knowledge management, organizational learning, and the like, especially in relation to lawyers and law firms, her blog and its rich treasure of archived material are an essential resource. Wecome to new blogger, Nick Duffill and his Beyond Crayons blog, which focusing on "mind mapping" tools for visualizing information. His tag line is "Businesslike visualization for late adopters." ... the threshold at which decoration interferes with content is quickly reached, and you find yourself wondering if the decoration is a substitute for content. ... decoration must pass a simple test - does it carry any information? If it doesn't, then don't be tempted to use it. Visit Nick's blog and you'll likely add it to your link list and RSS subscriptions, as I have. 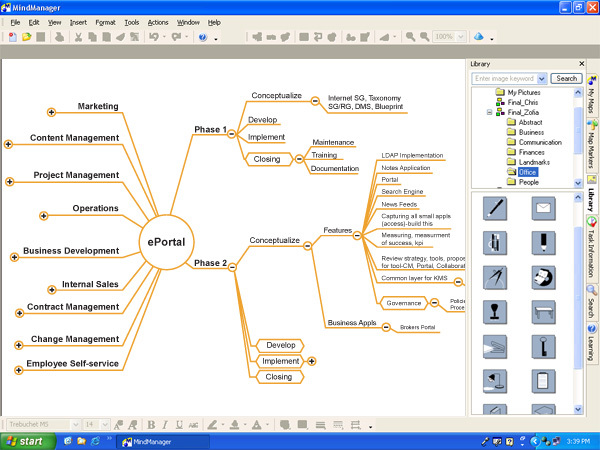 The only thing I'd like to see him add are some visual examples of his mind mapping ideas. 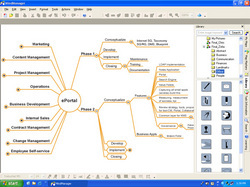 The MindJet software site (which Nick uses and recommends) gives some examples of mind maps, but it would be great to see just how Nick uses it in his own thinking about improving the information design of mind maps.